The What: Pro Co Sound is the exclusive authorized manufacturer of Neutrik’s opticalCON MTP 12 LITE and ADVANCED Fiber Assemblies, which will be on display at InfoComm 2016 (Booth C9918). The cables are intended for UHD, 4K, and 8K video production in fixed installations. Rugged and lightweight, the 12-fiber mobile field cables feature cable retention, a black PUR outer jacket, and are available in both single and multi-mode options. 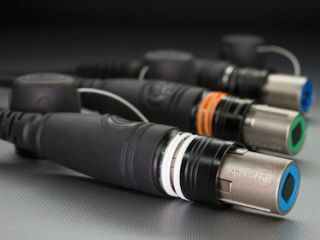 The What Else: Pro Co Sound has created the opticalCON MTP & SPLIT, featuring Neutrik’s opticalCON MTP 12 LITE connector and its MTP X-TREME & SPLIT with Neutrik’s opticalCON MTP 12 ADVANCED connector. Both cables feature excellent cable retention due to the use of aramid yarn in the design. The breakout and master cables are available as LC, SC and ST connectors. The opticalCON MTP & SPLIT is a durable and lightweight 12-fiber mobile field cable. The MTP X-TREME & SPLIT has a cut-proof and rodent resistant double-jacket glass yarn armored cable construction. These MTP connectors, based on conventional and established MTP connectivity, offer 12 optical fibers in a very small form factor. The opticalCON MTP 12 LITE is a 12-channel, fiber-optic connection system that works best for multi-signal transmission. It is compatible with the standard opticalCON ADVANCED NO12FDW-A chassis. The IP65-rated waterproof connector includes a push-pull locking mechanism, custom color-coding, rugged plastic housing and a rubber protection cap. Due to its automatically operated sealing cover, the connection is well protected against dirt and dust. The Bottom Line: The opticalCON MTP ADVANCED is a rugged and dirt-resistant 12-channel fiber-optic connection system for point-to-point multichannel routing. The cable connector is durable and comprised of strong all-metal housing, has long-lasting cable retention and is IP65-rated and water resistant in the mated state. Additionally, the color-coded connector features a push-pull locking mechanism. Its spherical shutter is innovative and guarantees low maintenance and easy cleaning, with no additional tools needed. The ADVANCED assembly has a laser protective metal shutter and a two-component rubber gasket seal, which is an optional part of the Chassis Connector for the standard MTP ELITE MALE connectors.